Fusion Window Cleaning is one of the leading commercial window cleaning companies serving London and the South East. Established in 2006, Fusion Window Cleaning has built up an excellent reputation for offering customers a quality service and has an extremely high level of repeat business. 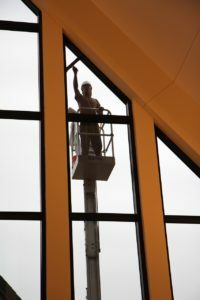 Fusion Window Cleaning provides customers with a full array of commercial cleaning services. These include the cleaning of both internal and external windows, cladding, uPVC frames and much more. Our state of the art equipment means we have no height restrictions – even those most difficult to reach windows are made accessible. Click here to find our more about our cleaning methods and technologies. We are fully insured up to £5m for personal liability and £10m for public liability. We are committed to health and safety and are constantly monitoring, reviewing and improving our procedures. In addition to this, every member of staff is DBS checked.